Our bodies come with a great built in navigation system that gives us constant feedback about whether we’re on the right track to achieving the life of our dreams: our feelings. If you’re feeling positive emotions like joy, happiness, and excitement, you’re on the right track. On the other side are the sadness, depression, and guilt. Those negative feelings are feedback you’re not on course with your passions and vision. Getting clarity on what your goals are first is an important step in achieving them. A GPS system is useless unless you know where you want to go. You’ll also have to know where you are today, so you can plot the route to get from A to B. Without a route you’ll probably get there eventually, but it will take much longer and you’ll probably take lots of detours along the way. Without a programmed destination a GPS system is useless, other than for showing where you are now. Unless you’re completely lost, that information by itself isn’t all that helpful. A map is only helpful if you know where you are now and where you want to go next. A lot of goals look different from up close, and might change or alter along the way. That’s fine. Goals are just a way to get going. Next time you’re faced with a small decision, choose in favor of your preference, instead of leaving it to everybody else. It shows your subconscious mind that you can have the things you want. Starting to honor your preferences on a small scale will help you get the things you want on a larger scale. The key to living a fulfilling life is to base every decision you make in favor of your passions. It will bring out the real you, and allow you to represent yourself from an authentic source without pretending to be something or someone you’re not. When you connect with your passions and make all choices in life in favor of those passions, you’ll live in a constant state of joy, feeling happy and successful. Joy is your guidance system, your internal GPS that will let you know whether you’re on the right track. If doing something feels like a chore, and you’re not feeling good about doing it you probably shouldn’t be doing it. 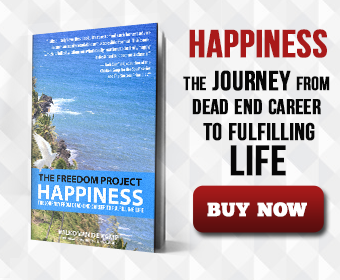 Read further: As you set and reach your goals with the tools from my Happiness book and others you can learn along the way, what would you do once you reach those goals?